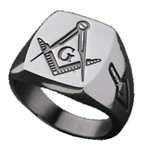 Masonic Ring 8mm Black Plated Tungsten band style ring with Masonic symbol. 8mm Black Plated Tungsten Carbide band style ring. 2mm thickness. The finish is highly resistant to scratches and scuffs, holding its mirror-like shine for years. Engaved Masonic symbol on front of band. Looks great with Square and Compasses facing up, but after two months of day-to-day wear under moderate outdoor activity, the black paint plating is already wearing off on the reverse side closest to the palm. The worst of it came as a result of using an aluminium paddle during a couple of two-hour kayaking sessions. For the price I paid for it, I wish I would have bought one of the silver-colored tungsten rings instead. I won't ever buy another "black plated" (painted) ring again! Macoy Publishing Reply: Sir we will send out another ring to you and issue a calltag for this one. We do apologize for any inconvenience you have been caused. This ring is great! I had another style ring that I broke twice, but not this one. Great ring for someone that works with their hands and is worried about damaging any other ring.